Choose a FREE ACCESSORIES Yes, please include Ball/Scorecard, Drink and Umbrella Holder ($60 VALUE - ABSOLUTELY FREE!!) No, Thank you. 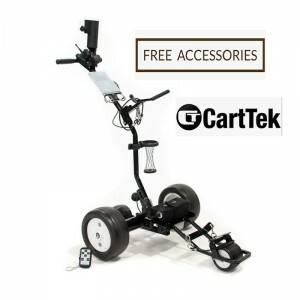 Cart Tek GRi-1350LH Lithium Battery Remote Control Electric Golf Caddy Cart Trolley - BUY FROM THE #1 TRUSTED Site for Remote/Non-Remote Control Electric Golf Caddies! (In Business since 2005). Call Us to Learn More about SPECIAL OFFERS! (702) 723-8348. For a limited time, we are offering the 2019 Cart Tek GRi-1350LH, Remote Control Golf Trolley, with 24V 8.8Ah 3.5lb Lithium Ion Battery, for $999.00, (MSRP - $1,395.00) with FREE SHIPPING to all U.S. customers (excluding AK and HI - we currently do not ship to AK and HI). Includes the Remote, Battery and Charger FREE ACCESSORIES (Scorecard/Ball Holder, Drink Holder & Umbrella Holder) - (Over $60.00 value!). GRX-1300LH is in stock. Ships in 1-2 business days. Once it ships, you will receive the shipment tracking information via email. The GRi-1350LH model is the same as the Gri-1350Li, but with a smaller 24V 8.8Ah lithium battery. Based on our customer favorite GRX-1250Li, this Lithium Ion battery powered Remote Control golf caddy is sure to impress. With the brute strength afforded by the tubular steel frame and the convenience of a 3.5 pound Lithium Ion battery, the GRi-1350Li is both tough and agile. With the efficient new 24 Volt power train with sleek internal drive motors and gearboxes, GRi-1350Li continues the great maneuverability that Cart Tek has become know for. Climb the steepest of fairways and descend with ultimate control – the best in the industry. All done with a battery weighing only 3.5 pounds. Incredible! You will be able to purchase the Cart Tek GRi-1300LH for the direct internet price of $999.00 (MSRP - $1,695.00) with FREE SHIPPING through our website. Complete with upgraded accessories: Stainless scorecard/ball holder, beverage holder, umbrella holder. Over $120.00 value - FREE! If you are looking for the most durable and robust Remote Control Golf Caddies look no further than the GRi-1300R. If you plan to use your remote control caddy 50 to 75 times per year, the GRi-1300R is the way to go. Remote control caddies with Lithium Ion batteries are designed for golfer who exceed 75 rounds per year or for those who can not lift the heavier SLA batteries. There are many different features and benefits to remote controlled golf carts to please give us a call so we can tell you how the different models fits your needs.